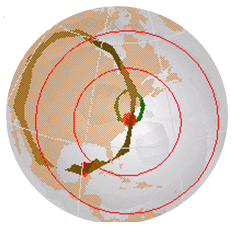 U.S. Mid-Atlantic geology themes for seven (7) U.S. States and parts of two (2) others. The following Google Earth themes were assembled by grouping USGS formations for each U.S. State into 34 colored units to minimize 'State-bounday' errors arising from map interpretation of otherwise contiguous geological units. The color scheme is designed to emphasize regional tectonic patterns. The topology of each State theme has not been altered, only generalized by this grouping to produce visual uniformity among adjacent themes. Formations are assigned to groups based on their primary lithology as coded in the original USGS KMZ themes. Please recognize that assigning geological formations to stratigraphic groups is subjective, especially when unit explanations are unavailable within their source files, or where formations are composed of multiple lithologies. The data below are provided as is, and can be downloaded and further edited. If errors are found, or if you have a suggestion to improve this product, please email me. Click on the image below for higher-resolution.